By Preethi Ranjit in UI/UX. Updated on April 9, 2018 . Phone numbers, besides names and emails, are the most frequently used contact information in online forms. Phone number fields are usually designed in a way that requires users to type the numbers in using their keyboards. This method frequently results in inaccurate data input. To reduce user input errors and improve the user experience of your site, you can create a GUI that allows users to quickly enter their phone number, in a way that is similar to date pickers. Â¾ Phone Number Field w/ Dial Screen by Preethi (@rpsthecoder) on CodePen. First, create an input field with a dial icon on the right that will open the dial screen on click. The dial icon just looks like 9 black boxes, arranged 3 by 3, must like what you see on a regular phone. I’m using the tel input type for proper HTML5 semantics, but you can also use the text input type if you want. First, create a new 'table' element in the DOM by using the createElement() method. Also give it the 'dial' identifier. Add a for loop to insert the four rows of the dial table with it. 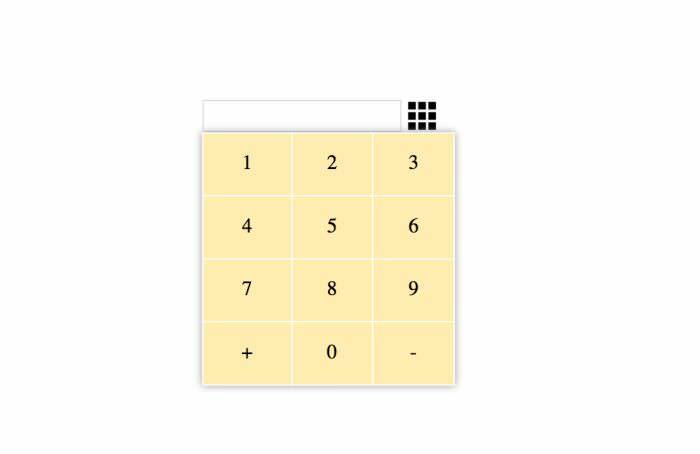 Then, for each row, run another for loop in order to add three cells per row. Mark each cell with the 'dialDigit' class. The last row is different, as it consists of two special characters, - and + that are used in phone number formats to identify regional codes, and the digit 0. To create the last row to the dial screen, add the following if statement to the inner for loop. To make it more attractive, style the dial screen with CSS. You don’t necessarily have to stick with my styling, but don’t forget to add user-select:none; property to the #dial container so that while the user is clicking on the digits, the text won’t get selected by the cursor. First, add the visibility:hidden; style rule to #dial in the above CSS to hide the dial screen by default. it’ll be only shown when the user clicks on the dial icon. To do so, you need to use the aforementioned querySelector() and the addEventListener() methods. The latter attaches a click event to the dial icon and calls the custom toggleDial() function. The toggleDial() function changes the visibility of the dial screen from hidden to visible, and back. Add a custom function that inputs digits into the phone number field on the click of the cells of the dial screen. The dialNumber() function appends the digits one by one to the textContent property of the input field marked with the #phoneNo identifier. Now, you have a working dial screen to input phone number field. To keep up with the CSS, change the background color of the digits in their :hover and :active (when the user clicks on it) states. Add a simple regex validation to validate the phone number while the user enters the digits into the input field. According to the validation rules I use, the phone number can only start with either a digit or the + character, and accept the - character afterwards. You can see the visualization of my regular expression on the screenshow below created with the Debuggex app. You can also validate the phone number as per the phone number format of your country or region. Create a new Regular Expression object, and store it in the pattern variable. Also create a custom validate() function that checks if the entered phone number complies with the regular expression, and if it’s at least 8 characters long. When the input doesn’t validate, the validate() function needs to give feedback to the user. I’m adding a red border to the input field when the input is invalid, but you can inform user in other ways, for instance, with error messages. // at least 8 characters for a valid phone no. The validate() functions needs to be called in order to perform the validation. Call it from the dialNumber() function you created in Step 5 in order to validate the value of the phoneNo variable. Note that I also added an additional validation for maximum characters (can’t be more than 15) by using an if statement. Your phone number picker is now ready, check out the final demo below. 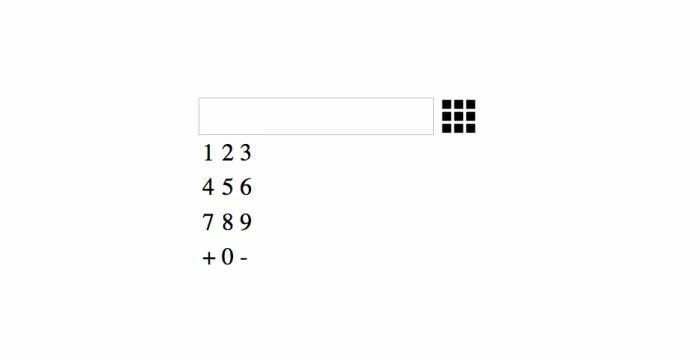 See the Pen Phone Number Field w/ Dial Screen by Preethi (@rpsthecoder) on CodePen.